In response to urging by CAMERA’s Israel office, the English edition of Ha’aretz this week corrected two articles and a subheadline which had erroneously blamed Israeli army fire for last week’s death of three Egyptian soldiers. Following the killing of three (and maybe five) Egyptian soldiers during the terrorist attacks last week near Eilat, Defense Minister Ehud Barak expressed regret for the deaths, but did not claim responsibility. While the Hebrew edition of Ha’aretz correctly reported Barak’s statement, in which the defense minister did not take responsibility for the Egyptian casualties, the English edition inaccurately stated that he did. CAMERA has repeatedly documented earlier examples of “Ha’aretz Lost in Translation,” and this latest case fits the pattern in which English translators or editors introduce false information into the original Hebrew text, providing international readers with a distorted and inaccurate account. Error (Ha’aretz, Barak Ravid, 8/20/11): Cohen presented Egyptian officials with Defense Minister Ehud Barak’s statement, released earlier Saturday, in which Barak expressed regret over the deaths of three Egyptian policemen from Israel Defence Forces fire on Thursday. Correction (Posted online as of 8/26/11): Cohen presented Egyptian officials with Defense Minister Ehud Barak’s statement, released earlier Saturday, in which Barak expressed regret over the deaths of three Egyptian policemen on Thursday. 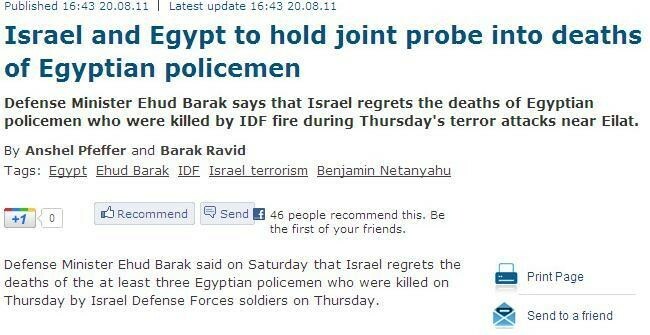 Error (Ha’aretz, Anshel Pfeffer and Barak Ravid, 8/20/11): Defense Minister Ehud Barak said on Saturday that Israel regrets the death of three Egyptian policemen who were killed by Israel Defence Forces soldiers on Thursday. Correction (Posted online as of 8/26/11): Defense Minister Ehud Barak said on Saturday that Israel regrets the deaths of three Egyptian policemen who were killed on Thursday. To read about these errors and corrections in Hebrew, visit CAMERA’s Israeli site, Presspectiva.